Venice is like no other city on earth. It’s mesmerising, like a wonderland of hidden treasures, flavours and smells. Speaking of smells, when I first visited Venice back in 2007, there was a lingering and offensive smell … an odour that suggested stagnant water, perhaps stagnant sewerage water. It’ so vivid in my memory that it was one of my concerns about returning to visit in the heatwave of 2018. Yet, I was pleasantly surprised. It didn’t smell at all. 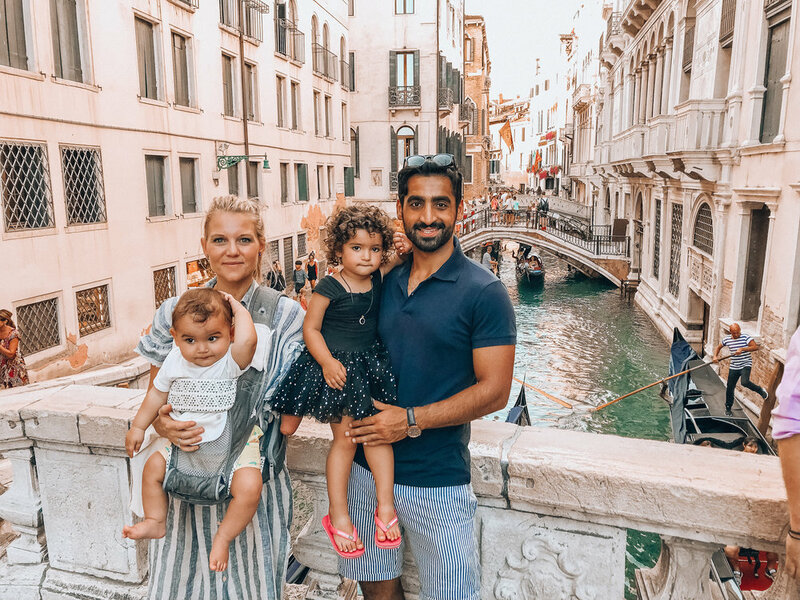 In fact the entire city felt clean and fresh, we even saw fish in one of the canals, a local was even more surprised, stating that he hadn’t seen fish in Venice since he was a young child. We arrived by train and once we stepped off and onto the steps of Venezia Santa Lucia Station we were captivated by the magic. There is a sense of illusion that floats around here, how can a city like this even exist! I felt as though I was in an idealistic fantasy … and then of course the kids and the thousands of tourists brought me straight back to reality, but it was a blissful few seconds of daydreaming. Venice is a destination hotspot; how could it not be! But of course, that means it’s busy almost all year round. But don’t let that deter you, there is plenty to do and see – even with kids! We hired a private taxi (boat) to take us from the train station to our hotel. We could have easily got a shuttle taxi, however, I made the decision to get a private taxi from the station and then to the airport on our departure because I knew we wouldn’t be going on a gondola (too expensive and not really romantic with two babies) and I also wanted the ease and comfort factor therefore I was happy to pay for the private boat. Hotel Saturnia & International is located in the centre of Venice. It’s in a fantastic location, only 300 meters from St, Marks Square. Housed in a patrician palace with typical Venetian forms and dating back to the fourteenth century, Hotel Saturnia overlooks the beautiful street full of boutiques of haute couture's biggest names. It has lots of old charm … no swipe cards here, just a traditional key with a big keyring identifying the room number. The staff are lovely and incredibly helpful. Breakfast is served in a beautiful outdoor setting, which if I’m honest was a little hot during our visit, but nevertheless it was lovely. My husband decided to spoil our daughter (or himself really) and had a special father daughter date at Cafe Florian – it’s considered to be the oldest café in the Europe, and popular with celebrities such as Andy Warhol and Miranda Kerr. Lunch – Bar Ducale, a very small café/bar around the corner from where we were staying. I don’t even think they have seating, it’s really just a handy place to grab a sandwich and a drink. A moment alone - I snuck away to Canal Bar (which is inside Bauer Venezia) - for some kid free time and ordered a drink and some olives, it was bliss … apart from the pigeons! We had no other choice but to visit in summer – it was SO hot, and SO busy. Try to avoid the European summer months to visit! 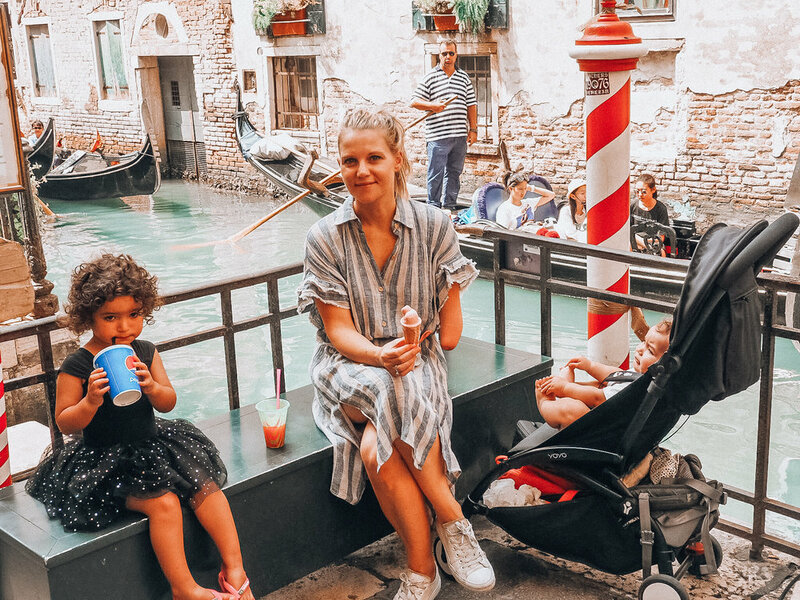 I would advise against taking a big bulky pram, as Venice is not pram friendly. 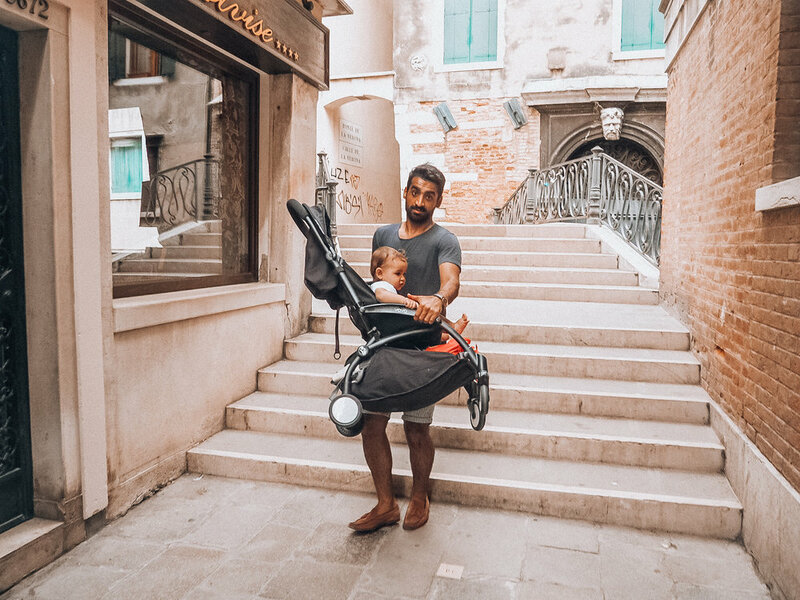 Having said that we took our Babyzen Yoyo because it’s such a fantastic travel pram, but we still had to lift it up and down stairs, thankfully it’s light! Ideally you want as minimal luggage as possible in Venice because you’ll need to fit it on boats and up and down stairs if your hotel doesn’t have a canal entry.